WHILE many would agree that a happy family makes up an ideal home, some may also concur that a comfortable house and an ideal environment can contribute to a happy family. Certainly, anyone would be more than happy if his or her ideal home became a reality. To find out what the majority of Malaysians want in an ideal home, EdgeProp.my and Lafarge Malaysia have initiated the Lafarge-EdgeProp MYHOME campaign, kicking off with a survey early this year. The survey ran from Feb 28 to April 15 and was open to all Malaysians nationwide. The findings were released on May 18 and these will form the basis for the design of homes that would be built and sold by Malaysia’s award-winning property developer S P Setia Bhd. The MYHOME project follows TheEdgeProperty.com-Lafarge Happiness in the City Index 2017 that measured the happiness level of urban dwellers in major Malaysian cities. The Lafarge-EdgeProp MYHOME survey managed to garner almost 14,000 respondents, with the majority from Selangor and Kuala Lumpur. In a nutshell, the survey revealed that Malaysians prefer a landed home within a secure environment and in a convenient location with easy access to amenities such as mass rapid transit (MRT) or light rail transit (LRT) stations, schools and public parks. As the majority of respondents (72.4%) hail from major cities in Kuala Lumpur, Selangor, Johor, Penang and Putrajaya, it is therefore no surprise that many (59.8%) prefer a gated community with amenities close by, especially near MRT or LRT stations (56.5%), schools (55%) and public parks or green spaces (50.4%). What does the ideal home itself look like? It will most possibly be a terraced house or townhouse (35%), or a bungalow or detached house (25.5%), or maybe a semidee (21.6%). The ideal built-up space is between 1,000 sq ft and 1,999 sq ft (45.5%) with at least three bedrooms and three bathrooms. And the budget? RM600,000 and below. 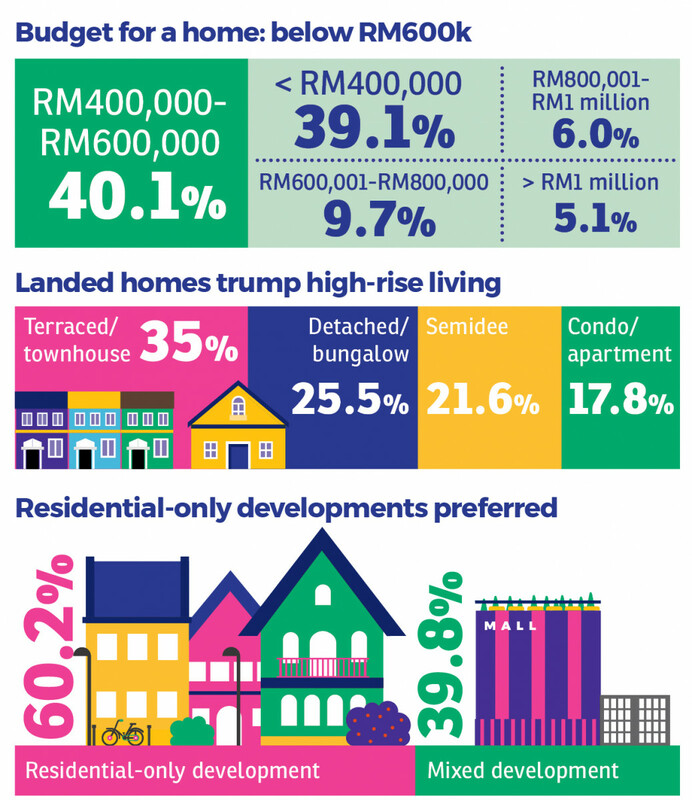 The survey revealed that the majority (40.1%) of respondents are willing to allocate between RM400,000 and RM600,000 to buy their ideal home. How to make the ideal home attainable? The survey findings resonate with EdgeProp.my’s observation that Malaysians are now more definitive in their wants and needs for an ideal home, says EdgeProp.my managing director and editor-in-chief Au Foong Yee. “While there are exceptions, Malaysians now generally accept the reality that their ideal home is not necessarily their idea of a dream home, because of increasing unaffordability due to slower income growth. 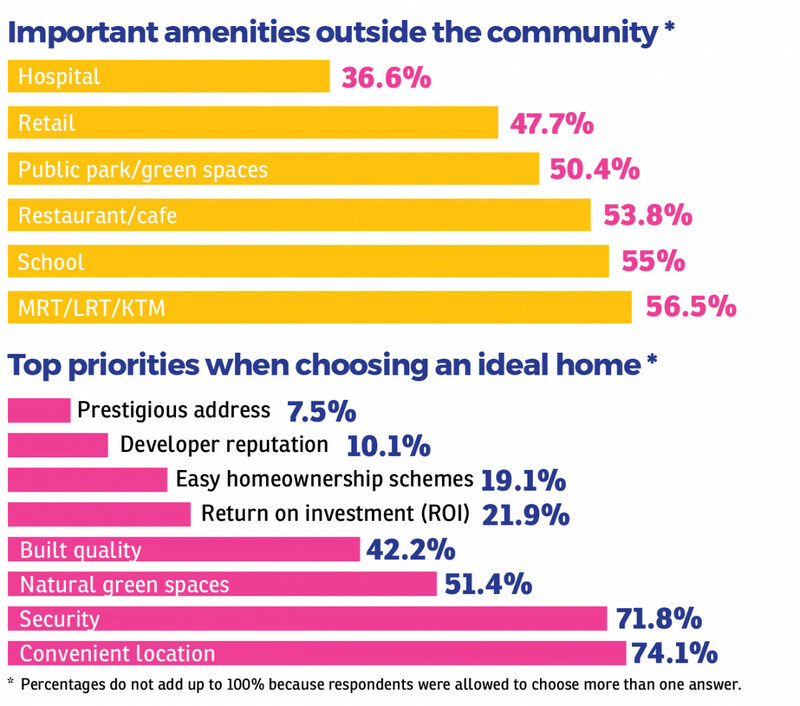 “While that may be the case, it is important for developers to engage with Malaysians on what they wish for in their ideal home, which is the premise for the survey. Buying a property, after all, is a once-in-a-lifetime investment for most,” she says. Lafarge Malaysia Bhd president and CEO Mario Gross stresses that the objective of this survey was to encourage discussion among Malaysians and to make them think about what they deem as important when choosing an ideal home. “We will analyse the results with our partners and supporters to translate the wishes of Malaysians into an actual physical build. During the process, we will carefully evaluate the options and available resources. The result might be a home that incorporates all that they wished for, but with a compromise on location, for instance, where the house may be located further away from the city,” he offers. “What we envision as our dream home can be vastly different from the ideal home or actual living abode that would best suit our lifestyle. It is also a question of balancing expectations and reality,” he adds. Now that we have a picture of the Malaysian ideal home, the question is, can we have it all within the majority-chosen budget of RM400,000 to RM600,000? According to property consultant Laurelcap Sdn Bhd executive director Stanley Toh, the ideal home envisioned by Malaysians in the survey is not impossible to achieve. In fact, the secondary market in the Klang Valley does offer some landed homes that fit the attributes of the ideal home. However, with a budget of less than RM600,000, one would have to consider the condition of the house, the tenure, the neighbourhood, the age of the home and other factors. “Terraced houses in Section 8 in Kota Damansara, Saujana Damansara, Putra Heights, Section 14 in Petaling Jaya and some older areas in Petaling Jaya, Kelana Jaya and Subang Jaya should fit the above criteria. However, we must keep in mind that the price will depend on the condition of the house,” shares Toh. However, he adds that generally, most landed homes in urban centres within the Klang Valley such as as Petaling Jaya, Subang Jaya and Kuala Lumpur are above the RM500,000 mark including single-storey terraced houses while newer ones can go above RM1 million. Hence, looking for the ideal home with a budget of RM600,000 and below, within urban centres, is difficult but not impossible. To Toh, the budget of RM600,000 and below won’t be able to pay for the Malaysian ideal home if they are located within Malaysian city centres due to high land cost and compliance cost. “Property developers often mention that land cost is one of the biggest component of the overall development cost. Prices of development land in city centres have seen a tremendous increase over the last 10 years. In addition, compliance cost imposed by the local authorities also contributes significantly to the overall cost of a completed house in recent years,” he says. Hence, one way to reduce property prices is to urge the local authorities to review their development charges, conversion premiums and contribution, to a level where it’s bearable for the developer to absorb without having to pass on the cost to consumers. Meanwhile, S P Setia executive vice-president Datuk Tan Hon Lim acknowledges that while there are a rising number of non-landed homes in the Klang Valley due to high land cost and construction cost, there has always been an underlying demand for landed homes. And he believes it is possible to develop a home that would closely meet the ideal home of Malaysians. “Taking S P Setia as an example, we have managed to launch our Starter Homes series in our matured flagship township of Setia Alam within the price range of below RM600,000 and I am proud to say that all three launches of the series held this year were sold out within hours of their launches,” notes Tan. The buyers of the Starter Homes — dubbed Carisa, Adina and Careya — get to enjoy the amenities within the 2,525-acre self-contained township of Setia Alam, which has been developed since 2004. Besides Setia Alam, the developer will also be soft-launching the Starter Homes in Setia EcoHill 2 in Semenyih this weekend. According to Setia EcoHill 2 website, the homes called Barras are double-storey linked houses of 20ft by 70ft, with selling prices from RM513,000 onwards. Although these homes are not near any MRT or LRT station, they have good accessibility via highways and dedicated interchanges. They are also located within self-contained townships with amenities. “As for optimal construction cost, S P Setia has been a fervent advocate of the Industrialised Building System. This system also uses less labour as most of the structural components can be prefabricated off-site,” says Tan. This story first appeared in EdgeProp.my pullout on May 25, 2018. Download EdgeProp.my pullout here for free.